In order to provide your hotel with the best possible solution, we first analyze what your circumstances are today and develop a trolley for your future requirements. We take into account many aspects including how many rooms per floor, lift size, how big the service rooms are, corridor width and if there are stairs between floors. We also analyze your processes and what is involved – filling the minibars, floor materials, your mopping system and even how thick the towels are. 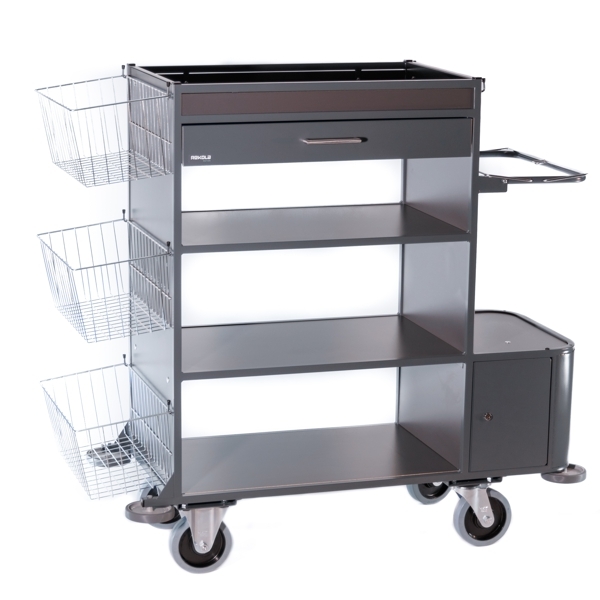 There is not one solution that fits all – that is why we custom make every trolley for our customers benefit. This model is for slightly smaller hotels or where there is limited service room space. 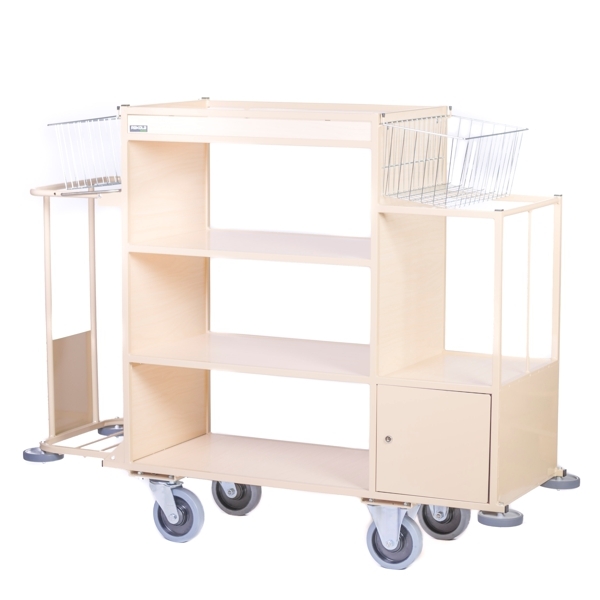 The basic element on this trolley is the center section which is 75cm long. This mid area is for both linen and towels and the top is for smaller items for distribution into the guest rooms. The mid-section also has a separate drawer for guest material such as information leaflets and sanitary disposal bags. This model is already suitable for larger hotels where there is more than 20 guest rooms and larger service rooms per floor level. The basic element in all our hotel trolley models is the center section. This we have reserved for the linen and the top for all kind of smaller items which are distributed into guest rooms. The standard length of the shelves is 75cm but as we custom make the trolley the length can be adjusted according to your requirements.